I don’t even remember this watch. It must of been a gift. I had received no complaints so I guess they liked it. 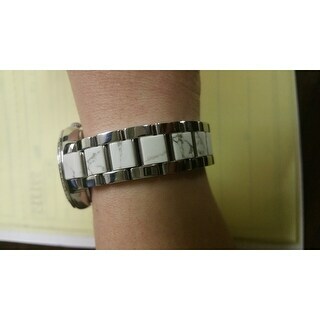 Silver-tone stainless steel case and bracelet with white center links. Crystal accented bezel. White/grey dial with rose gold-tone hands and crystal index hour markers. Roman numerals mark the quarter hour positions. Quartz movement. Minera crystal. Push/pull crown. Case: diameter 30mm thickness 9mm. Band: width 7mm length 7.25in. Pushbutton clasp. Water resistant up to 50 meters/165 feet. Functions: hour, minute, second. 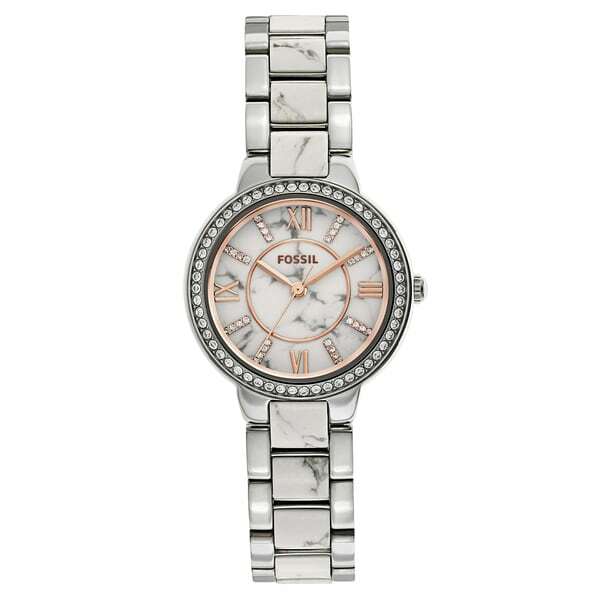 Fossil Women's ES3962 Virginia White/Grey Dial Two-Tone Stainless Steel Bracelet Watch.All measurements are approximate and may vary slightly from the listed dimensions.Women's watch bands can be sized to fit 6.5-inch to 7.5-inch wrists. This is a beautiful watch that can be worn for either dress or at home. I have not taken mine off since I received it. It is waterproof and I wear it doing dishes, taking a shower or in the pool. I have never had a problem with it and it has not lost so much as a minute since I put it on.It has Roman Numbers on the face and they are really easy to see. The only thing else I can say about this watch is I love it and I would recommend it everyone. This watch is gorgeous. The face isn't too big or too small, perfect for tiny wrists. Only wish the marble was a lititle darker on the face and had the date. I definitely recommend this watch. This is an absolutely gorgeous watch. The rose gold with stainless look is so beautiful. It has a good weight to it without being heavy. This watch looks much better in person. The style is timeless and the watch is very classy. I wear it to work and to social functions and get so many complaints. It isn't bulky or too big so it is very feminine. I own this in 3 colors by far my favorite watch by Fossil. Classy gorgeous watch. Absolutely love. Very easy to adjust size and settings! Great price too! 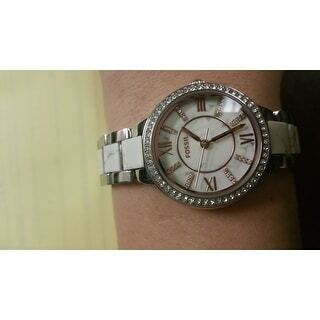 Very cute, I love this watch. It's dainty and not too flashy. I have a fairly large wrist and it comes with enough links to fit me. I would definitely recommend this. WOW! Stunning watch. Bought as Christmas present for my mother and she loves it. I may have to purchase one myself. I am a huge fan of Fossil watches and this one does not disappoint. This was a Christmas present to my Nurse Grand Daughter. 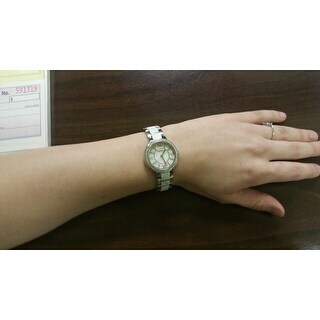 This is all she really ask for, a good Fossil watch for her job as Nurses do have to have a watch they can depend on. She said, I couldn't have made a better chose. Beautiful color. I love fossil watches, but I like the small faces, it’s getting harder and harder to find them. The other nice thing about fossil is that you can remove the links yourself. "Does this watch operate on a watch battery?"